Dutch painter. Little is known about the life of Reyer Jacobsz van Blommendael except for a few details gleaned from documents concerning a certain Risje van Blommendael, who was a wealthy resident of Haarlem. For instance, a notarial deed drawn up in Haarlem in 1676 reveals that she had a brother called Reyer who was a painter. On 27 June 1628, a Reyer was baptised in the Nieuwe Kerk in Amsterdam: he was the son of Jacob Reijersz and Grietje Jans. This may well have been the child who grew up to be our painter, as two years earlier a girl by the name of Risje, the daughter of Jacob Reijersz and Grietje Reijners, had been baptised in the same church. 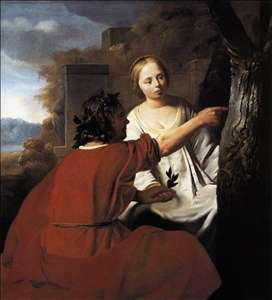 It is not known who taught Van Blommendael. Goudstikker thought his style was probably influenced by a trip to Italy. We do know that he joined the Haarlem Guild of St Luke on 14 March 1662, for which he paid a fee of four guilders and ten stuivers. There is also an entry in the guild ledger from September 1663 concerning the payment of two guilders and twenty stuivers to the children s home for Reijer van Blommendael . He was still recorded as a member of the guild in 1668. On 20 February 1663, Van Blommendael was consulted to value the contents of a household in Haarlem. A few more facts emerge from other notarial deeds drawn up by Risje van Blommendael, for instance that he was living in Amsterdam in 1669. On 10 March 1675, Risje appointed him as the executor other will, describing him as a master painter residing in The Hague . In 1676, she sold a house in Aelbersberg (known today as Bloemendaal) to a cousin of hers. The deed mentions that Reyer had lived in the house and that their father, Jacob Reyersz, was a bleacher by profession. Van Blommendael was buried in the St Bavokerk in Haarlem on 23 November 1675. The costs of the funeral, which amounted to 25 guilders, suggest he had been reasonably well off. Risje van Blommendael was buried in the same grave seven years later, on 3 January 1682. Van Blommendael s extant oeuvre consists of a few pastoral scenes, history paintings and half-length figures making music. There is no evidence that he earned a living from his work. His individualistic style is easy to identify on the basis of three signed paintings. 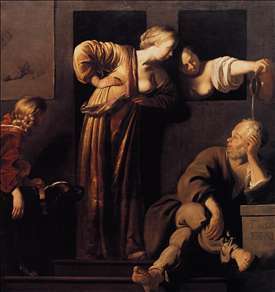 His work evokes associations with the Utrecht Caravaggists as well as the Haarlem classicists, particularly Caesar van Everdingen. A few of his paintings were previously misattributed to Abraham Bloemaert, Jan Gerritsz van Bronchorst, Caesar van Everdingen, Gerard van Honthorst and Johannes Vermeer. See more details about "Paris and Oenone"
See more details about "Xantippe Dousing Socrates"